The Hubble Space Telescope looked for pulsating Cepheid variable stars in 19 remote galaxies, part of a project to refine the cosmic distance scale and to improve understanding of how fast the universe is expanding. 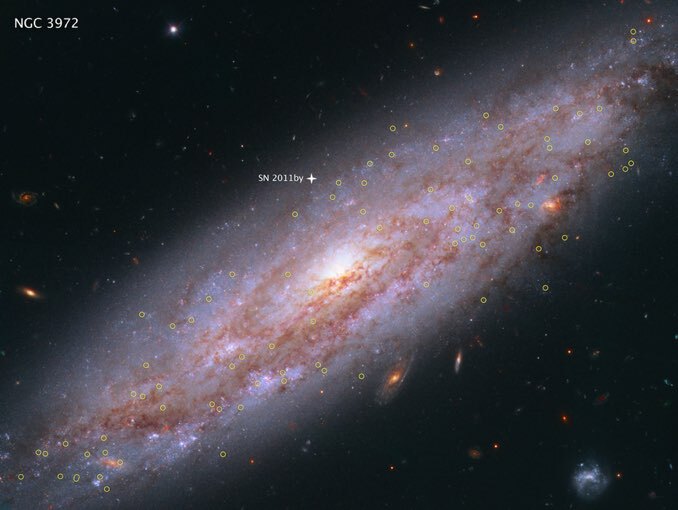 In this image, pulsating stars known as Cepheid variables, critical mile markers on the cosmic distance ladder, are circled in yellow. The Hubble study indicates the universe is expanding faster than previously thought. Lengthy observations by the Hubble Space Telescope indicate the universe is expanding faster than predicted by standard models incorporating dark energy, the mysterious force causing the expansion to accelerate, and that Einstein’s cosmological constant, thought by many to define dark energy, may not be so constant after all. But the observations also could mean dark energy, whatever it might be, is stronger than the cosmological constant built into Einstein’s equations, or that dark matter interacts with normal matter more strongly than previously suspected, or even that some as-yet-unidentified sub-atomic particle is responsible. The bottom line, however, is the same. Something is not quite right with the standard model of the big bang and its aftermath. “If it doesn’t go away, this is arguing for some misunderstanding we have about the nature of the universe,” Nobel Laureate Adam Riess, a co-discover of dark energy, said in a telephone interview. How fast the universe expands over time is reflected in a number known as the Hubble constant. The European Space Agency’s Planck spacecraft determined the expansion rate of the early universe by studying the cosmic background radiation, or heat, left over in the immediate aftermath of the big bang 13.8 billion years ago. 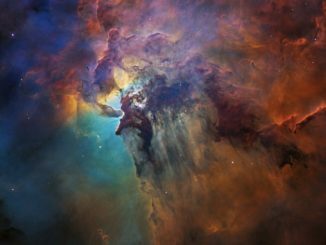 Riess and Stefano Casertano, both with the Space Telescope Science Institute and Johns Hopkins University in Baltimore, Maryland, led a team of researchers who used Hubble over the past six years to sharply refine measurements of galactic distances to more accurately calculate the Hubble constant. They came up with a value of 73 kilometers per second per megaparsec, a discrepancy of about 9 percent. “You can think of the universe growing just like a child growing, and you can think of the cosmic microwave background as a snapshot of what the child looked like at that time,” Riess said. “We measure their height on a door and we mark the date. And then, the parents and the doctor and all the experts say gee, following normal growth charts, this child will reach a height of six foot two, or something like that, when they’re full grown. Another Hubble target galaxy showing Cepheid variable stars and a Type 1a supernova. Years ago, Riess said, astronomers might have assumed the discrepancy between the Planck and Hubble measurements likely was the result of less-than-precise measurements and unavoidable error. To determine how fast the universe is flying apart, astronomers must first know how far away various galaxies might be. To directly measure the distance to a star, for example, astronomers note its position in the sky from one side of Earth’s orbit and then again from the other side, creating a triangle with a known baseline — the diameter of Earth’s orbit — and two known angles. From there, high school trigonometry gives the distance to the star. But as distances increase, those angles grow exceedingly small and extremely difficult to measure. To move out even farther, astronomers rely on variable stars that periodically brighten and dim in a predictable fashion. The pulsation rate of such Cepheid variables is directly related to their intrinsic brightness and by comparing the observed brightness of a distant Cepheid with the actual brightness of one nearby at a known distance, astronomers can figure out how far away the more distant Cepheid must be. Moving out even farther, Type 1a supernova explosions in remote galaxies brighten and fade away in the same predictable fashion, allowing them to serve as “standard candles” in the more remote regions of the cosmic distance ladder. Riess shared a Nobel Prize for using Type 1a supernovas to show the expansion of the universe began speeding up about five billion years ago, thus helping discover dark energy. The Hubble Space Telescope was used earlier to directly measure the distances to Cepheids in the Milky Way at distances up to 1,600 light years from Earth. Over the past six years, Riess, Casertano and their team developed a new observing technique that extended Hubble’s direct reach to Cepheids some 12,000 light years away. That, in turn, allowed them to more accurately determine the stars’ actual brightness and to better calibrate the apparent brightness of Cepheids in galaxies hosting Type 1a supernovas. The result is a more accurate distance ladder. 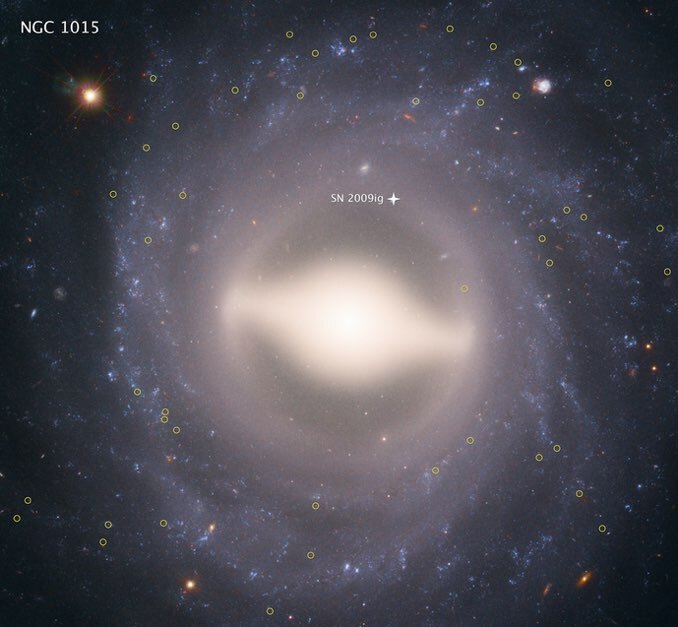 By comparing those revised distances with the expansion of space as seen in the red-shifted, or “stretched,” light from receding galaxies, the team came up with a different value of the Hubble constant, one that indicated a faster expansion than expected. “We are incorporating the acceleration (due to dark energy),” Riess said of their calculations. “We still don’t understand the physics of dark energy, so there are some different possibilities for the physics of it. But the most vanilla, or sort of naive one that people most often use is to assume that it is Einstein’s cosmological constant, that it’s a constant energy of empty space and that it doesn’t change over time. “If you look at the best data we have, just from the dark energy part, it really does look like the cosmological constant,” Riess said. “While it’s possible dark energy plays a role, to me it looks more and more like it could be a new particle or something about the way dark matter interacts. It is known today that merging galaxies play a large role in their evolution, and the formation of elliptical galaxies in particular. However, there are only a few merging systems close enough to be observed in depth. 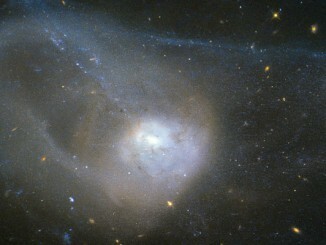 The pair of interacting galaxies seen here — known as NGC 3921 — is one of these systems. But ‘close’ is a relative term: NGC 3921 lies 270 million light-years away. 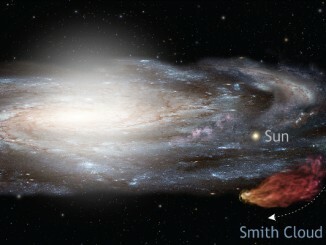 New Hubble observations suggest that an immense cloud of hydrogen gas was launched from the outer regions of the galactic disc around 70 million years ago and is plummeting back toward our galaxy at nearly 700,000 miles per hour. If this so-called “Smith Cloud” could be seen in visible light, it would span the sky with an apparent diameter 30 times greater than the size of the full Moon.